I love hearing stories about older people who chew life up, no matter their age. Today a friend told me about her mum Mary who volunteers at a nursing home. Mary would be in her 70s but she regularly pops in to visit people who don’t have any family nearby. 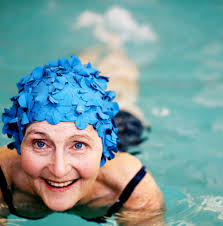 A few years ago, Mary used to help when some of these lovely old people would go to their fortnightly swimming class. One of the people in this group was Elsie who at 98 wanted to learn to swim. 98! Elsie was terrified of the water but was determined to learn. How incredible is that – to still want to learn a new skill at that age. So impressive. It took a few goes and poor Elsie would cling terrified to Mary when she was in the water but soon she could float along happily hanging off a noodle. Now 102, Elsie no longer takes to the water as the cold is a bit too much for her but really, she doesn’t need to. She conquered her fear and made her dream of learning to swim happen. The right people, the right stories can teach us so much about never giving up on your dreams, about being brave, about not letting a number define you.